Take our (supremely unscientific) quiz and see if you’ve got what it takes to work for a startup or if your corporate is more your comfort zone. I was asked that question by a vendor during my first week with a startup beverage company. Not only did I not know the answer, I didn’t know half the words in the sentence. Was I supposed to know what a high-sheer vortex was? More importantly, was I really the right person to ask? Turns out, the answer was yes, and yes. I was working in a startup; not only was I the right person, I was the only person. Although some entrepreneurs will hire experts in each primary area of the business, most tend to run a lean ship in the startup years. Cash is king, and payroll is the enemy. So most entrepreneurs believe fewer employees, doing more work, leads to a healthier bottom line. In most cases they’re right. But what about your bottom line? Do These Hats Make Me Look Fat? For some, the stress of diving into the unknown will be too much. For these employees the idea of working outside their area of expertise will make them uncomfortable. These employees should not work in a startup. For others, the idea of being involved in all areas of the business will be exhilarating. These employees will revel in the fact that each day they directly affect the business. These are the ideal entrepreneurial employees. 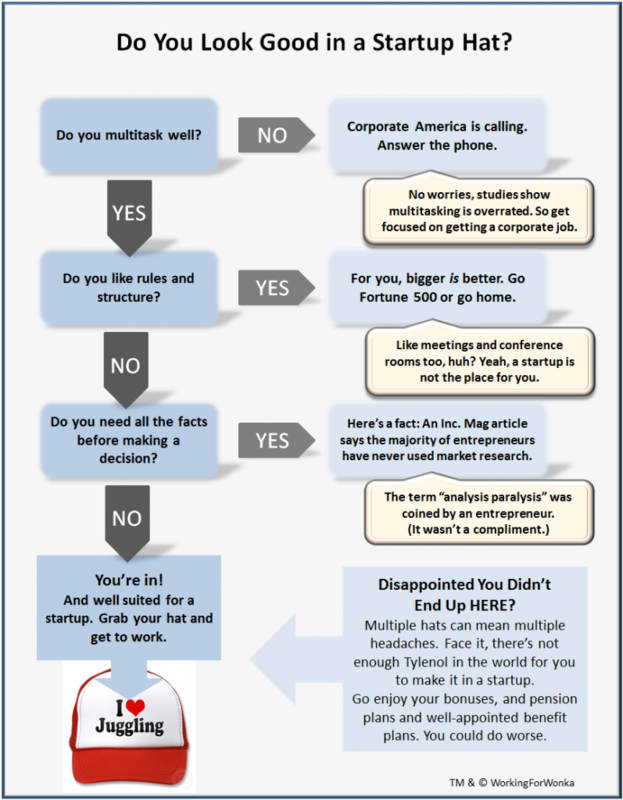 Are you an ideal candidate to work for a startup? Take our (supremely unscientific) quiz and see if you can juggle a job with a startup. Working for Wonka? Know this: Although you may be an expert in your field, if you’re working for a startup you can bet that you’ll be plowing the neighbor’s field too. Start shopping now for a hat with feathers. You’ll be winging it a lot. Have you had to work outside your comfort zone in a startup? What was your carboxymethyl cellulose moment? Take Red bull, it was tested in marketplace. People hated the name, taste and packaging. Even then Dietrich Mateschitz launched it! In fact, he created a new category to dominate across the world! Wow Kamil. Bold statement! I have two friends who own market research firms that are choking on their coffee right now. Most large corporations use pretty sophisticated research methods to understand future actions of consumers. However, many entrepreneurs believe their gut instinct over anything that predicts the future. There’s a great Inc. Mag article (http://bit.ly/j1Roof ) that compares how corporate managers view research vs. entrepreneurs. Interesting stuff! Thanks for commenting. You always have interesting insights! Yes, many multinational corporations are into market research. They want to back their proposals and strategies by huge stats. it sells to the top management. Top management are interested i financial statement and Wall Street. They are not interested in creating category and then dominated it by brands. They are more interested in buying established brands from entrepreneurs or SMEs. How many large corporation you have found who take bold steps and create a new category? Very few. You are exactly right. It’s very difficult to innovate in a large company, so frequently corporations buy innovation from startups. And then, sadly, they often run those brands into the ground when they can’t maintain the same brand feel and the consumers sense that. Well, Kathy, that was quite an example. I guess you would have to ask for the correct spelling of those words and do some research. I wouldn’t know where else to start. You do have to expect odd requests. I had a crazy boss who asked me to write a letter to the Bar Association to complain about an attorney. That was pretty funny. Glad my signature wasn’t on that letter. It’s funny you say that; I had to look the words up several times before putting the quote in the post! It seems like you have as many bizarre work stories as I do. Don’t know if that is a good, or a bad thing. At least it makes me feel like I’m in good company. I’m a really bad employee and your post above says why. I love fast, don’t need all the facts, love to multitask and get bored really easily.. that’s also why I do better with an employee to help with details. I’m always looking for the next thing. Any start ups out there need me? I’m awesome in a start-up! Ha! You’re awesome in a startup….because you’re an entrepreneur. Aren’t you? With a booming business from the looks of your site. I think the question is, are there any employees who are looking for the next thing, that want to work FOR you! I belong in the first category because I have always been a startup myself. I have been a business and life coach for a number of years. A client was referred to me about five years ago. She wanted advice on how to improve her blog. A BLOG?????? I had heard of blogs but knew nothing about them. She had been invited to do an interview on a well known radio station. The topic was how to start a blog. They had asked her to submit questions which she then asked me to review. The questions she suggested were so technical that only someone who had great knowledge would even start to understand. I asked her to let me write the questions. Starting with “What is a blog?” and continuing with very basic information anyone could relate to. They used my questions. The interview was a great success. I started a blog that next week. Still here annoying everyone! Just started my sixth year. I wished I’d started blogging six years ago! It doesn’t surprise me that you were doing it first. From what I’ve learned about your through our comments and online exchanges you’ve been involved in, and succeeded in, a number of different types of businesses. The fact that you were comfortable switching around like that (or pivoting…the most overused buzzword today) means you’re all startup material. Running it, or working in it, you pass with flying colors Corinne. you ask, What was your carboxymethyl cellulose moment? Had to think about that for awhile, but is was years ago working in the office for a chain of restaurants. I was to do payroll, which was not a problem along with tax and than came the employees insureance. As for the insurance i was not experienced in that field. However given enough time I figure things out and found the right person in the insurance company to always go to for answers employee’s would have. Life is always fun when you are willing to learn and don’t fold under the presure. That’s a great attitude Debbie, and a necessary one for people working in startups. If you don’t find learning the new exciting, you’re in the wrong place. Thanks for sharing your story! A parallel to this question, is do you cook with or without a recipe? can be unpredictable, it does work along a proven patterns and systems. Anne – I LOVE the recipe comparison; it’s perfect. I am the opposite of you, recipes stress me out. I cook, mostly sans recipes. But I never bake, since you have to be so precise with ingredients. It makes me a nervous wreck. Never thought about that being a parallel to a startup, but you’re right! The good news is that if you’re working in a startup (or running one as you may do) there’s a high likelihood of getting your beer wish! Well, Kathy, for the first 30 years of my career I worked in the big corporate world and loved it. Yes I did. I enjoyed my career, the income, the travelling…the responsibility. But then I got bored…the love and passion was no longer there and I made the transition to set up my own on-line business. Took a lot of hard work – I was working full-time and building the on-line business, part time. Now full-time on my own business and I love it! I don’t think I could have done it without the experience of corporate life. Running a department of 1000’s of staff is like running your own business. 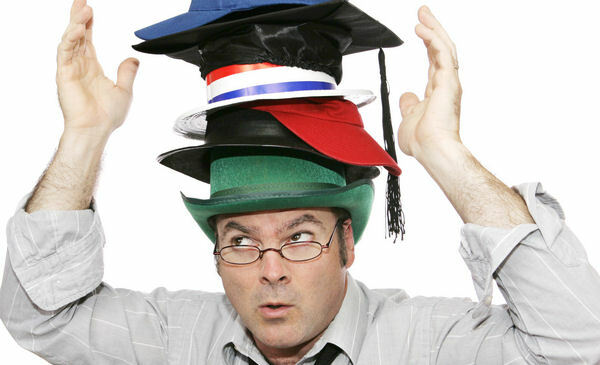 I wears a lot of hats when I first started my business. Therefore, I can relate to your post. It’s excellent and I love the diagram very much.